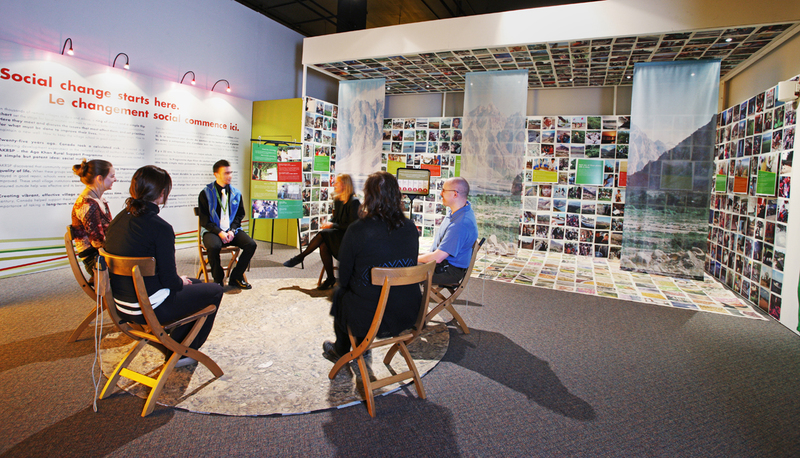 Bridges that Unite is a bilingual travelling exhibition that explores the 25-year partnership between the Canadian International Development Agency and the Aga Khan Development Network. Powerful images and voices showcase accomplishments enabled by Canadian generosity, and invite visitors to consider Canada’s role in some of the world’s most isolated and impoverished regions. Over 500 featured photos, 15 countries profiled, and six cities visited. That's Bridges that Unite in a nutshell. Presented by Aga Khan Foundation Canada (AKFC), this bilingual travelling exhibition invites visitors to consider Canada's role in international development by exploring the 25-year partnership between the Canadian International Development Agency (CIDA) and the Aga Khan Development Network (AKDN). It took nine months to plan and a 53-foot long truck is required to ship it, but some 26 000 people have strolled through the thought-provoking exhibition. Powerful images and voices showcase the accomplishments enabled by Canadian generosity in some of the world's most isolated and impoverished regions. Speaking in Montreal's Concordia University, the exhibition's most recent stop in March 2010, AKFC Director of Operations Shakeel Hirji explained that development must be sustainable, cross-cutting, and pluralistic, and it requires all kinds of people to be successful. These were some of the key development messages that Bridges that Unite sought to share during its two-and-a-half year tour across Canada. Canadians play an important part in AKFC's development work – as project managers, interns, volunteers and donors. But they do not always appreciate the benefits of this work. The Foundation's CEO, Khalil Shariff, pointed out this gap in development knowledge at an international journalism panel held in coordination with Concordia University's Department of Journalism and AKFC. “Many Canadians – many of our key partners – only have a shallow understanding of what development looks like compared to what professionals think development looks like,” he said. “And that's a dangerous situation.” “It's not sustainable,” he added. Bridges that Unite tries to give something back to Canada by highlighting what the country's contribution has meant to the world. For Sarah Christie, a public affairs coordinator at AKFC, Bridges that Unite has been a great success. First hired as a guide for the exhibition's first stop in Victoria in February 2008, Christie went on to participate in the year-long AKFC International Development Management Fellowship before joining the Bridges that Unite team on the road in Halifax. She has seen firsthand Canada's positive impact in developing countries. The feedback she has received proves that the personal stories really do make a difference in helping Canadians understand just how important their role is in the success of the projects shown throughout the exhibition. “It makes people feel proud to be Canadian when they see the impact of these programmes,” she said. “A lot of visitors didn't have much international development knowledge and I think Bridges that Unite inspires them to get involved,” Christie explained. Even Islamic Art and translation classes have toured the exhibit at Concordia as part of their studies. Many parents have also shared their desire for their children to see the exhibition and understand that they, as Canadians, are a part of this legacy. “It really drives home the point to people, how important this work is,” she added. Whether in education, rural development,or culture, Bridges that Unite encourages visitors to think about international development in a different way. Christie believes that these stories, pictures and activities do a lot to counter the negative image that international development work has in the media, where it is usually portrayed through imagery of suffering, malnourished children who live in extreme poverty. As with any journey, the travellers were changed by the experience. In each new venue AKFC looked for creative ways to help visitors navigate the many themes and stories within the exhibition. 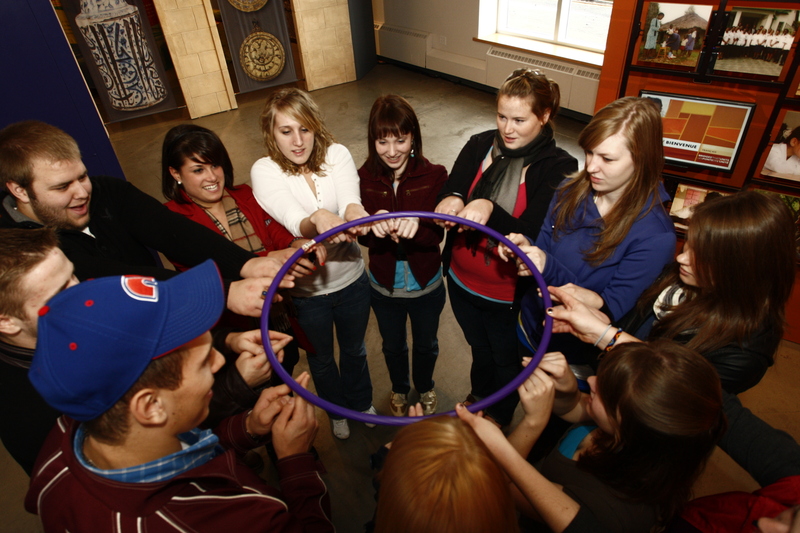 At the Waterloo Regional Children's Museum, for example, guides were trained to help youngsters grasp basic concepts around social change, and to think about the role of Canada and Canadians in the world. Educational games with names like the “Harambee Hoop” were popular with children and adults alike. With teachers keen to continue the conversation with their students, AKFC worked with Toronto-based Classroom Connections to develop a four-lesson resource on sustainable development and global citizenship. Public events organised with local partners, were another vital hook to attract diverse audiences, who expressed interests ranging from higher education in the developing world to foreign news reporting. A section of the exhibition dedicated to Afghanistan grew in response to visitors' desire to know more about the AKDN's multi-faceted work there. AKFC's film Giving Peace a Chance and performances by renowned Afghan musician Vaheed Kaacemy attracted lively crowds eager to explore aspects of the country that are largely unknown to Canadians. There is no question that the exhibition had an impact on those who visited it. Surveys conducted as part of the audience research programme said that 87 per cent felt inspired by the role of Canadians in international development after visiting Bridges that Unite. A further 66 per cent left wanting to learn more about how they could become involved in international development. The exhibition was especially hopeful to the Canadian Jamat, many of whom have immigrated from the developing countries where several of these programmes have been implemented. “A lot of people left years and years ago and have not gone back. It's really nice for them to see the positive changes,” said Christie. Several events were held in recognition of the Ismaili community's involvement with these programmes, from tours for religious education students to seniors in the Jamat. Bridges that Unite also hosted World Partnership Walk volunteers, sponsors and donors. 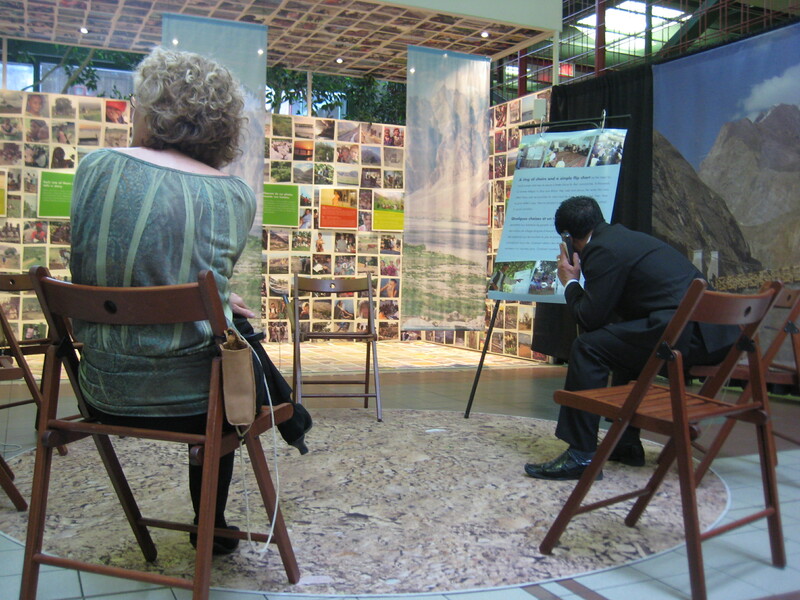 The Walk campaign got underway in Canada on 8 February 2010 following a National Volunteer Conference at the Delegation of Ismaili Imamat in Ottawa. This conference sought to inspire and educate new and returning volunteers about the projects that are supported by 100 per cent of the funds raised through the Walk. Part of this education included a tour of the Bridges that Unite exhibition, which happened to be in the nation's capital the time. “One of the reasons we really like to have the Walk teams and Jamati events is that we do get a lot of support from the community,” Christie said. “I think it's nice for them to see the concrete impact of the projects.” The emphasis on Afghanistan is a perfect example of this direct link. Not only does a large portion of the Jamat come from Central Asia, it is a hot topic for all Canadians, who are often surprised to hear that there is more going on in this troubled country than insurgency attacks and military operations. AKFC's community-based approach to addressing poverty on multiple fronts over the long-term is fostering sustainable livelihoods, strong civil society and is providing opportunities for girls and women to gain an education. For Christie, there is nothing better than being able to share the joy that is associated with this new empowerment in rural communities. “Having sat in a ring of chairs and seen what actually happens and the changes on their faces, it makes it feel more real,” she said. This personal touch is present in each and every panel of the exhibition, in the audio recordings and the videos shown, as real stories of change are shared. Canadians were also invited to spark the conversation (at the exhibition or online at bridgesthatunite.ca) by completing the sentence “The world needs more…” Their answers include an inspiring mix of buzz words like “hope”, “love” and “peace” and smart solutions like “participation”, “common sense” and “patient listening”. And of course, “more great ideas”. Through and through, the generosity of Canadians shines on the faces in the displays and on those of Bridges that Unite visitors, no matter where they come from or where they are going. “It's nice for them to see that there is always hope and that success is possible. It is always possible,” said Christie.